I’d almost given up on these arriving in time for Houston next week, but they have. 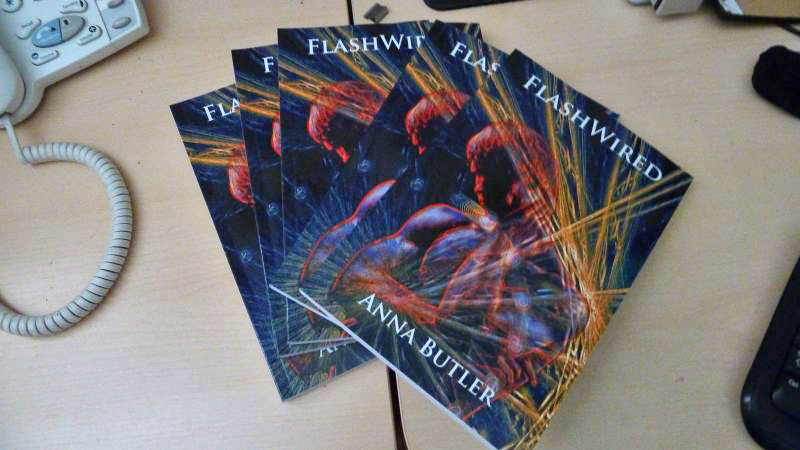 Five proof copies of FlashWired!! I’ll keep one for myself, but will excise the ‘proof’ page from the back of the others and see if anyone wants to buy one. Heavens, but it’s exciting to have a physical copy of something I’ve written! Houston is only three days away now. I’ve got all my clothes ready to pack, I’m getting my hair cut on Monday, I’m loading up a USB with stuff for the workshop and the panel that I’ll also send myself so I can have it on the iPad, I’ve got my new (bright orange!) shoes stretched out, the camera’s on charge and D has found me a couple of extra memory cards so I can take hundreds of pictures of the Josephine tiara… I’m as ready as I possibly can be.